This voluntary group was founded in 1991. Its members continue to work towards highlighting the many issues around accessibility for everyone, to and within our local environment, here in County Cavan, and helping to bring about positive change. County Cavan Access Association liaises with individuals, businesses, other voluntary groups and disability representatives and local authorities to promote awareness. The group tries to get commitment towards improving conditions for those with disabilities and others who may have accessibility problems. The group also tries to address negative or ill-informed attitudes. The Association works closely with Cavan County Council, having the Council’s dedicated Access Officer, Emma Breiden, as a member. This ensures that many issues around accessibility can be discussed directly with those with the power to change things. A lot of the work of the members of County Cavan Access Association involves alerting business premises and facilities to specific oversights that make them inaccessible to people. 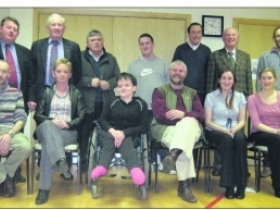 Co. Cavan Access Association meets, at 8.30-10pm, on the second Thursday of the month, excluding a break during the summer, usually in the Irish Wheelchair Association’s Resource Centre in Corlurgan Business Park, Unit 1. Block D, Ballinagh Road, Cavan. Details are printed in the Cavan News Items in the Anglo Celt, in the local Mass missalette, and are mentioned on local radio,Shannonside Northern Sound’s Community Diary, prior to meetings.